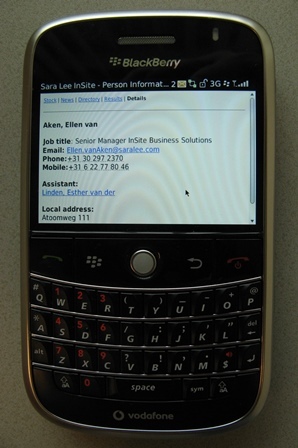 The oldest mobile intranet in history? It was long before the iPhone was introduced. 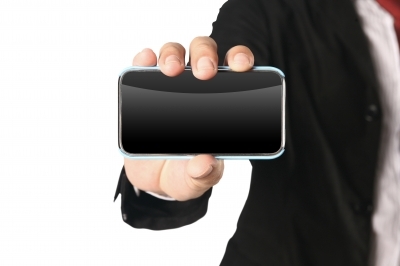 It was long before the word “app” had the meaning it has today. If it had any meaning at all. The BlackBerry was all the rage in the corporate world. Everyone wanted one, and only senior management had one at that time. Having a BlackBerry meant you had arrived! 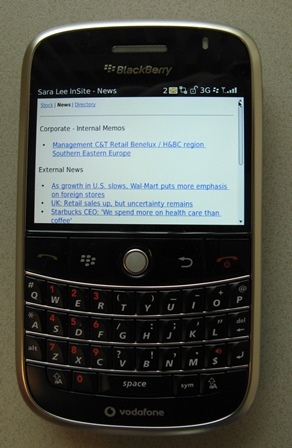 That year our team launched an “icon” on the BlackBerry’s home screen, that opened a small part of our intranet. That part of the intranet that we thought would be useful if you were not in the office. This must have been one of the first mobile intranets. It was created and introduced by another part of the team I worked in, and all credit goes to the people who had the foresight and the skills to come up with the concept and make it happen. With this post I want to give them the applause that they deserve. 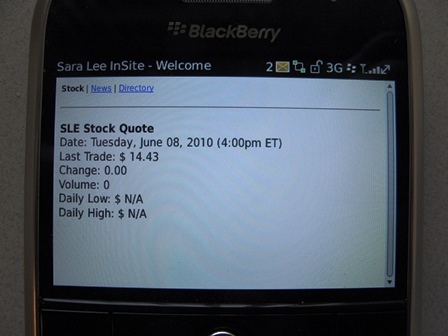 While reading about mobile intranets, and people proudly showing that they have features such as an employee directory especially for mobile use, I suddenly remembered our old BlackBerry app and that I still had some screenshots. So, for history’s sake, here are some more details. Remember that all information shown is outdated. 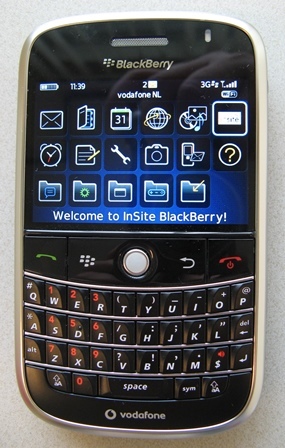 The intranet “icon” was automatically pushed to your BlackBerry, but not everyone was aware of it, or how you could use it. Of course we communicated, but we did not reach everyone. But everyone who knew about it, was very happy with it. It was still functioning when I left the company in 2011. This was the icon. It showed our intranet’s logo. On the top right you see the icon leading to the intranet. It was the intranet logo, unfortunately not very well visible. If you clicked it, you could choose 3 options. This was updated regularly throughout the day. I have not used this much myself, but I know there were people who could not do without it. The Stock Quote, updated every 15 mins. or so. We showed Corporate News and External News only, because we could not target the regional and local news, as we did on the regular intranet Homepage. When I was sitting at an airport, it was good to be able to learn about organizational changes as soon as they were posted. I might have been on my way to a business manager who had made a promotion…or a sudden exit :-). The News. Only limited news types could be shown. This was really useful for me, especially when travelling. You could search for someone, and their name, position, telephone numbers, email address and assistant would be shown. I have often used this functionality when my plane was delayed or cancelled, or when I just wanted to email or call someone while being on the road. If anyone in my audience is still discussing an employee directory for use on-the-go: yes, this is useful. I think it should be one of the first things to implement on a mobile intranet! The Employee Directory. This has been really useful to me. Jesper Bylund has described his Multi-device project for the City of Malmö, and added a lot of screenshots. We have seen Barclays MyZone, which caused Twitter to explode when it was demonstrated at DigitalWorkplace24 in 2013. There is a video and a presentation about it from other events. Verizon has won the My Beautiful Intranet 2014 award for their mobile HR Portal. Ofcourse we all know the mobile intranet of Parliament UK, which was one of the first serious mobile intranets, and which won an Intranet Innovation Award in 2011. You can search for “mobile” in my video collection although I can not guarantee I have tagged them all. Please let me know if I have missed a tag.